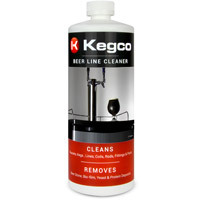 This 32oz bottle of Kegco Beer Line Cleaner is an inexpensive and environmentally friendly way to remove beer stone, bio-film, yeast, protein, organics and mineral deposits from beverage lines. This nitrate free formulation is low in phosphates and 100% biodegradable. The concentrated formula does not cake or harden and it mixes instantly with water to create the cleaning solution. At 1/2 oz. of cleaner per quart of water, a 32 oz. container makes 64 quarts (16 gallons) of powerful, quality cleaner. Kegco Beer Line Cleaner is easy to use and works with all electrical, mechanical and hand pump cleaning kits. Potassium hydroxide, an alkaline compound with easy rinsing qualities that is less corrosive to metal parts and fittings, is the primary active ingredient in Kegco Beer Line Cleaner. We blend potassium hydroxide with a proprietary blend of surfactants and chelating agents to help the caustic loosen and suspend soil. Kegco Beer Line Cleaner is ideal for direct draw systems, tap boxes, or any system that uses shorter runs. It is is fantastic for small craft and home brewing operations, as it quickly enters solution, removing and suspending soil in all water temperatures without extended contact times or excessive rinsing. It is a mild liquid cleaner that won't discolor metal or harm plastic and is easier on hands than most brewing specific products. Comments: Didn't realize how important this product is! I now flush beer line with every keg change. Also I disassemble the faucet and clean its components as this is where I was seeing tiny black flakes of ?. Now every beer is a fresh one. Great product and worth every penny! Comments: This does what it claims to do. The price is fair.